I wake up in the morning with a head full of mosquitos, the sodapop fizz of doubt in my veins. The words of the ancient monk come to my mind: don’t be fooled! I force myself to sit upright, wash my face, light a candle and sit down on the cushion with my nattering gremlins. Scoot over a bit and give the gremlins some room. Observe, as their buzzing gradually fades. In half an hour my phone app chimes and I bow to the generations of ancestors who, like me, have awakened in doubt and somehow summoned the courage to move forward. 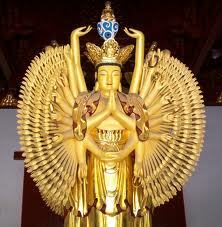 The last thing I do before starting my day is I chant the Bodhisattva Vow. A Bodhisattva is a being who achieves enlightenment, and yet elects to remain in this mad bad world until every last being has also awakened. She’s not stepping aboard the Love Boat until there is room for everyone. In accepting the truth of absolute interdependence and turning down a ticket to Nirvana, the bodhisattva commits the ultimate act of self-lessness. On the surface it sounds like a pretty harsh decision. But maybe not. Beings are numberless, I vow to save them. Delusions are inexhaustible, I vow to transform them. Reality is boundless, I vow to perceive it. The awakened way is unsurpassable, I vow to embody it. I find it perversely comforting to start off my day by launching into pure impossibility. Knowing none of these goals are achievable, the clock stops. I can relax, because there is no deadline to achieve the impossible. Even so, the time to start â€“ again, and anew â€“ is right now. So I better get cracking.